Strategically located on a secluded, peaceful shoreline of beautiful Norris Lake, "Shady Grove" provides the best of all worlds. 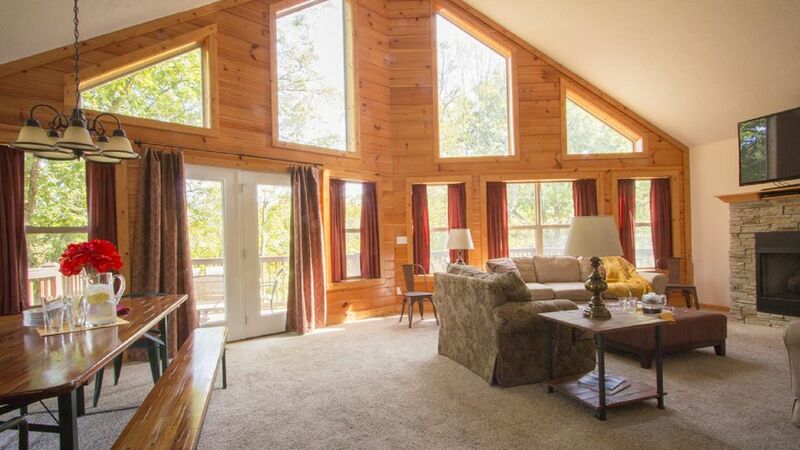 This huge 8 bedroom cabin provides plenty of room for friends & family. Take the unbelievably easy walk to your private dock located in a sheltered cove. There, you will enjoy the pristine waters of Tennessee's cleanest lake. Grab your kayak or paddle board and stroll around the acres upon acres of no wake, protected water. When the time is right, cruise past Flat Hollow to enjoy endless miles of uncrowded ski water. John Bertke lives in Dayton Ohio and enjoys visiting Norris with his friends and family. He enjoys fishing and smoking cigars. He took over management of this property in November 2016. They say 'location' means everything. "Shady Grove" is 15 minutes from LaFollette, 10 minutes from the main road, inside a private community, nestled in trees, right on the water's edge. I'm an avid fly fisher, my wife loves to golf, and my daughters never tire from wake surfing so my whole family stays happy when we visit Norris. Shady Grove is built on a secluded shoreline making your own personal swimming area in the TVA's cleanest lake. Enjoy your own personal dock. Great room on main level with dining room & kitchen. Lower level game room with TV, couches, chairs, billiards, air hockey. Shady Grove cabin at Norris Lake is the perfect place to gather with your friends and family with plenty of space and things to do. Please call us for suggestions on golf, boat rental, restaurants, bedroom details, etc. We are here to assist you. Your group discovered the advantages of this spectacular cabin. You are correct that during the summer that river, called Norris Lake, widens, opening up into a large swimming area right off the dock. It is as though this cabin has its own perfect corner of the world. The inside i would say was clean and very nice but the outside grounds are a disaster. There was a ton of garbage under the decks, around the fire pit and in the driveways. Absolutely no grass/lawn area and the second driveway is kind of useless for there is not enough stone in which i imagine the rain washes it away. Would not recommend for pet owners. The dock is very nice, lake is gorgeous and a great gathering place. The owner was very responsive to questions thankful for home away never sent us what the house had available in it, directions house to get there, and the do's and don't. Would have been helpful packing if we new before we were 600 miles into our trip. I am glad you discovered this "clean" and "great gathering place." Thanks for the compliment on our repose to your needs from painlessly getting you an extra night and directing you to strategic watercraft rentals. From here your review went off the rails - Norris Lake is a mountainous terrain and finding large rentals on flat area "with grass" is very, very rare. These cabins are usually built on the sloped shorelines and are required to be above the dam's elevation. Upon seeing your "garbage under the decks"' I rushed over to investigate and found the "garbage" was decking materials used for periodic deck and steps repairs. With expensive waterfront property, many of these cabins do not have room for garages. As a result, materials may be stored under the decks. I did find some Pepsi cartons near the fire pit apparently used as campfire kindling. Perfect for my family week to celebrate my retirement. Really clean with a modern wel-stocked kitchen - don’t bring anything. Plenty of outside seating. We rented a boat which fit perfectly in the covered dock. Each of our kids’ families had their own area and bath. Not for those challenged by steps but great for us! Property exactly as described...fantastic for large groups. The kitchen was outfitted for cooking in contrast to some properties we have rented that did not have adequate dishes, pans, etc. The deepwater dock was very enjoyable, but you would do well to bring a pop-up tent for shade during the hotter parts of the day. We had a nice time were pleased with the property. I am glad you enjoyed the cabin and property. We enjoy having spirited groups like yours. This house was even prettier in person than in the pictures. It is very spacious, updated, fully stocked and very clean. We loved that it is the last dock in a cove so it was quiet and private. The owner, John, was very responsive when we contacted him during our stay. I highly recommend this house. Your review was spot on. It is hard to truly capture these large cabins on camera. You also nailed the seemingly private swimming area feeling like you are in your own world on this wildly popular lake. Great house and great location! Fewest steps to the lake I have seen at a Norris house!!! We had a great time. Would definitely rent this house again. The cabin is a short 2 minutes away from the marina for restaurant, convenient mart, watercraft rentals, etc. A 15-20 minute drive leads to a large grocery store, hospital, drug store, and fast food.